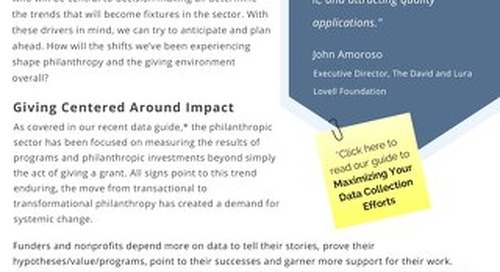 Those working in the philanthropic community are consistently asked to do more with less. The pressures of limited resources and increasing need create frustrations but also present opportunities for creative problem-solving. We asked grantmakers to give us their best advice on how they make life easier, and they didn’t disappoint! From building strong relationships to structuring LOIs and eligibility quizzes - here’s what the experts - your peers - had to say. Relationships are the cornerstone of communication. Early work in this area can pay off later by mitigating miscommunication, decreasing grantees’ fears, and helping you understand what’s happening on the “other side.” Have conversations early, and you’ll decrease frustrations later. Scheduling informal check-in calls with grantees about 3-4 months into a project helps us build closer relationships with grantees and become aware of early problems in time to help correct them. Encouraging applicants to talk through ideas with us before they apply helps make sure they are a good fit and neither of us are wasting time. I even offer to read proposal drafts before submission to make sure the applicant is on track. Automating your grantmaking process by going online and putting systems in place can help streamline your process and increase efficiency. By saving time on your grantmaking process, you can spend more time focused on your mission. Putting things online has been enormously helpful in making our foundation work. We have trustees all over the world and doing things digitally makes things flow much better. Online grantmaking greatly increased our efficiency. Continuing to streamline processes and automate the process as much as possible keeps making us even more efficient. 3. Ask For the Right Information. What information do you really need? Taking a little extra time up front to thoroughly review your application will not only save your grantees time (and help with that relationship building piece!) but will also save you and your reviewers time later on. Asking the right questions will allow you to spend less time reviewing irrelevant information, allow your grantees to spend more time crafting quality answers for the right questions, and give you the opportunity to find the best fit for your funding dollars. Think hard about whether you are using the information you are asking for....and do this annually to try to make the process as easy as possible for grantees. Fill out your application and reports as a grantee! Treat your LOI as a strategic tool, not only for weeding out grantees that don’t align with your mission, but to educate them on why they aren’t a good fit. This will not only save you time in reviewing lengthy applications that won’t get funded but may also save your grantees’ time in the future by informing them more clearly on the types of projects you do or do not fund. An eligibility quiz could be another viable option if you have strict guidelines but tend to get a lot of applicants. Often, scholarship applications are “gated” behind an eligibility quiz. By setting up logic that determines whether someone will even be eligible for funding, you save a lot of time and resources on both sides. Be very clear upfront about what kinds of causes/projects the Foundation does and does not grant to. 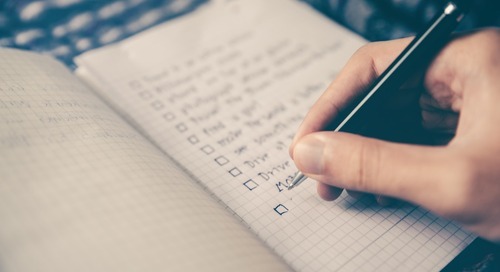 Use the LOI as a tool to help eliminate those projects that do not fit with the Foundation's granting priorities so that neither the charity nor the Foundation waste significant amounts of time in reviewing longer, more detailed applications that do not align. Streamline the LOI/application/reporting process. Ask only for the information you really need. Be as transparent as possible in your communications. Set standards (like deadlines) and stick to them. We went virtual (no more paper files) and it's a huge improvement. Get to know other grantmakers and find ways to work together. 5. Strive for continual improvement. . . not perfection. Reviewing and refining processes and procedures is the best way to maximize efficiency. This will look different for every organization, but the important point is to never settle for “that’s the way it’s always been done.” Setting a timeline to review processes is a good way to start. . . even if it’s only once a year, it will get the ball rolling and give you benchmarks to measure against. We have started documenting all of our processes - I used free process software (draw.io) to help us understand a.) how we organize our internal processes and b.) what they look like broken down. It helped us identify redundancies, gaps and from there, we had a base point to start from to identify strategies to clean our processes up. We re-evaluate literally every grant cycle - not some big lengthy thing but we talk about what was great and what needs tweaking and we do it at the end of the cycle rather than waiting for the next one to come up. When it comes right down to it. . .
It’s all about finding creative ways to structure your processes, listening to and learning from others, keeping open lines of communication, and continually learning from your peers. It won’t always be perfect, but you can find small ways to improve and over time those will add up to big efficiency hacks! We are consistent in the analysis of our requests and the evaluation of the project after it has been completed and a report has been submitted. We also host a Grant Seekers Workshop after organizations have been notified that their LOI has been approved and that they may complete a formal application. We have found that by doing so, we address many questions about the application and about what our foundation is looking for, before each organization contacts us with their questions. In this workshop, we walk them through the application and explain what type of information we are looking for. We also show them how to navigate through the online process, which is very helpful. We feel that the workshop allows us to develop better relationships with our grantees and makes them more comfortable when they need to reach out to us for help in the process. And we also invite potential grantees to attend the workshop, so they will know ahead of time what they will face when they do apply.